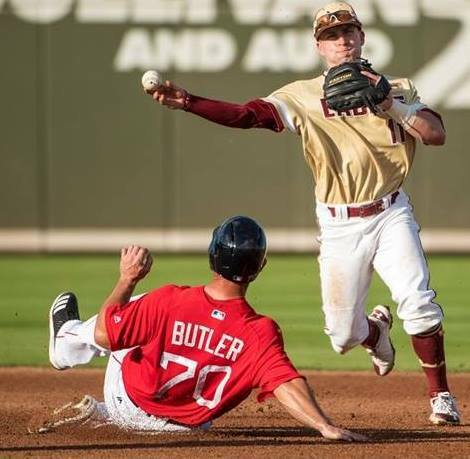 The Boston College baseball took on the Boston Red Sox for the 27th time in a seven-inning exhibition game at JetBlue Park Fenway South in Fort Myers, Fla., on Thursday afternoon. The Eagles fell, 4-2, to the professional team, but tallied a few hits and strikeouts off the big leaguers. The Red Sox jumped out to an early 2-0 lead in the first inning and added two more in the fourth. The Eagles scored their two runs in the seventh, including one on an RBI by sophomore Jake Goodreau. Sophomore RHP Matt Gill recorded two strikeouts on the day and the entire BC pitching staff tallied four K's. Sophomore Dante Baldelli, freshman Chris Galland and redshirt junior Scott Braren registered the three BC hits on the day with Braren doubling in the fourth.